At the forefront in terms of quality and professionalism, offering an excellent customer service; the restaurant Andamur Guarroman has been recognized by the Spanish Ministry of Industry, Tourism and Trade, with the distinctive “Commitment to Quality Tourism”. The distinctive “Commitment to Quality Tourism” is the support that certifies the fulfilment of the requirements established in the SICTED methodology (project for the improvement of the experience and satisfaction of the tourist – promoted by the State Secretary of Tourism), a recognition of the effort and commitment to quality and continuous improvement, at the same time that distinguishes the establishment against the competition. Businesses and services that hold or wish to choose the certificate “Commitment to Quality Tourism” are subject to certain controls, a way as to ensure the satisfaction of the clients, their safety and installations comfort; work groups to develop proposals for improvement to the destination, as well as assessments that measure the adequacy of the company/service to the standards of quality. 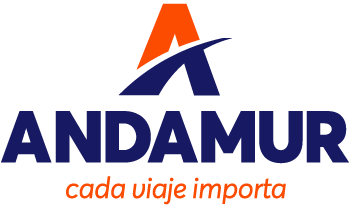 From Guarromán to La Junquera, passing through the Limit, San Román and Pamplona; Andamur service areas offer a comprehensive service to professional haulier, following the highest quality standards.